Ustaz Ibrahim and I got there a bit early to set things up, and within a few minutes there were two police-type cars there, which read "United States Secret Service - Uniformed Division" and the cops asked us what we were protesting about. Then a few minutes later a State Department security/secret service guy came up, introduced himself and asked lots of questions about why we were protesting, chatted about the time he had spent in the Middle East, and mentioned that the Embassy was "concerned" about our protest. He asked us to stay within a small perimeter and said that they didn't want to create an uncomfortable situation because the Egyptian government provided a lot of security for the American embassy in Cairo so out of reciprocity and courtesy they had to address the Egyptian security demands in Washington...Ibrahim quipped that it was already starting to look like a Cairo rally, with more security than protestors present. There were official and security type Egyptian men coming up near the entrance and chatting and looking at us. Perhaps they were a bit flustered to not have their reassuring rows of amn al-markazi there. The protest started at noon, there were about ten of us to begin and more trickled in later, I would say there were between 20 and 30 total, including graduate students, professors, journalists, Naiem Sherbiny from the Ibn Khaldun centre, a few socialists and Joe Stork of Human Rights Watch. 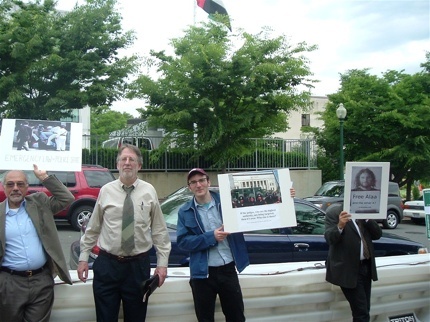 We held up signs protesting police brutality, calling for judicial independence, the freeing of political detainees and for Bush to live up to his remarks about supporting democracy in the Middle East. No chanting, though some guy passing by in what looked like a construction truck called out "Baa-tel! baatel!" when he saw the Mubarak baatel poster (baatel = useless, illegitimate). (A renegade embassy employee? a random construction worker?) Then the security guys asked to talk to Ustaz Ibrahim and me again and asked if we would agree to move the protest across the street. We said we would be willing to if that was the law. He hemmed and hawwed and explained that there was a grey area in the law about whether or not one had to stay at a distance from an embassy when protesting, but said that it was at the request of the Embassy and they would be much more receptive to hearing our message if we would just move the hell away (not his words, but you get the idea). He mentioned that the Egyptian embassy was "very well connected in Washington" and the ambassador could pick up the phone and talk to Bush when he wanted...Egypt is an important partner for us in the region, etc. We said we felt under no obligation to do the Egyptian government any favours. By this point some media people had arrived - a photographer from AFP who took lots of pictures, the DC bureau guy from Al Ahram, and a reporter from Al Jazeera - Hossam's relative, Mahmoud Hamalawy (small world!). There was a phone call from Nora Younis in Cairo telling us that people had been beaten up and re-arrested, and sent the names of those who had been arrested. Ibrahim on behalf of the Alliance of Egyptian Americans had put together a letter for Ambassador Fahmy and asked to present it, and he and I and Mr. Sherbiny went in and spoke briefly with the deputy assistant third factotum something or other, talked a bit about why we were protesting and how disappointed we were in what the Egyptian government was doing (it was amusing to see how the functionary maintained all the Egyptian politenesses, taht amraking all over the place). When I mentioned the arrest of activists, he asked "who? who has been arrested?" I could only remember Mohamed Sharqawy from Nora's message and mentioned him, as well as Alaa Abd al-Fattah. We mentioned that Mubarak was backsliding on his promises for reform, and the factotum gave us the usual "that was only a few months ago, these things take time, you can't expect overnight change" line - we retorted that we expected at least good faith, and it was not acceptable to be throwing people in jail for voicing peaceful opposition and beating young people up in the streets. Sensing that he was trying to keep us there and figuring it was more productive to talk to journalists, we left. The barred gate you see in the pics was the front gate and Ibrahim made a show of escaping from prison, as you will also see in the pictures! We also distributed a backgrounder on the judges crisis, some recent reports from HRW on repression, and a petition that people could send to their representatives calling for the release of prisoners, support of the rule of law and fair elections and basing the US-Egypt relationship on democracy and morality for a change. When we left at one o'clock, security guys asked us if we were planning any further protests. Ibrahim replied "if they are going to keep arresting people like this, then we will have no other choice." I hope to send it around to encourage people to follow up and keep the pressure going. I think the protest was largely symbolic and good for building networks and laying the base for mobilization - several people expressed interest in continuing some sort of activism on the issue. I find it encouraging that we managed to scare the embassy enough to get their police-state/playground bully instincts going (not that it takes a whole lot). 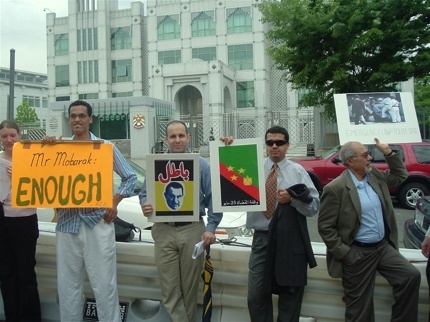 Holding the enough sign there is Ahmed Fekry, who translated Montasser Al Zayat's book on Ayjman Zawahri. Wearing the tie is Joe Stork, Middle East Director for Human Rights Watch, and next time to him is my former colleague Ethan Heitner, now of TomPaine.com. More pics available on request for anyone who wants them.